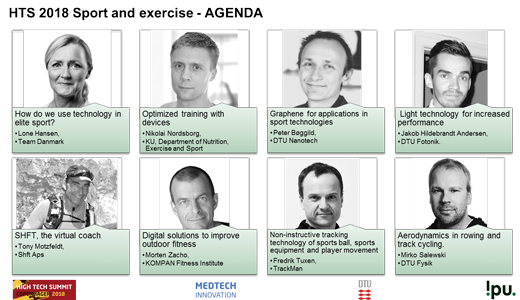 On October 11th 2018, IPU assisted with the execution of the track on sports technology at the DTU High Tech Summit (HTS). It was really a great pleasure and honor to be part of the planning and execution of this event, and for those not attending, here’s a write-up about the motivation and thoughts behind the program, and take home messages from the presenters. So first of all, why do we even focus on sports technology? Well, actually, we believe that the more appropriate question could be: “why don’t we focus much more on sports technology in Denmark”? First of all, sports are just plain and simple good fun, it is healthy and it brings people together. Whether performing sports with others or cheering for the same team/ nation, sport provides the reference point that we relate to and get together around. Whereas the above reasons might appeal to some and not others, the financial and societal potentials are less subjective. Sports are a gigantic market with huge potentials for providing growth and establishing workplaces. An increase in the overall fitness of a population provide increased work efficiency and enormous savings on medical expenses. From a technical point of view, just the sports equipment market is estimated in the magnitude of 4-500 billion kr. Additional to this, you have the benefit of synergy effects in the technology development between sports and non-sports applications, where the large commercial volume could benefit more specialized industrial uses. Sports and sports technologies are driven by the desire to become better, much like conventional technology development. But the passion and dedication that is characteristic for sports technology is rarely seen other places. When developing technological solutions that are intended to be used in ex. the Olympic Games or providing the research base for obtaining such developments, that same spirit of common commitment to achieve the ultimately best result is transferred to the development/research team, and is highly motivating. Due to the highly cross disciplinary field of sports technology, development and research projects are fantastic opportunity to combine polytechnic research and industrial teams, with a clear goals and high motivation to reach them. So with all that in mind, we really want to thank the HTS 2018 steering committee, DTU and Medtech Innovation for putting this topic on the agenda, and for inviting us to participate in the planning and execution of the event. In the spirit of the HTS, the program was made with the intention to provide both scientific contributions and business talks, all related to the use of advanced technology in sports. The very key point of the talk was that in elite sports, very small margins make the difference between podium and non-podium results. 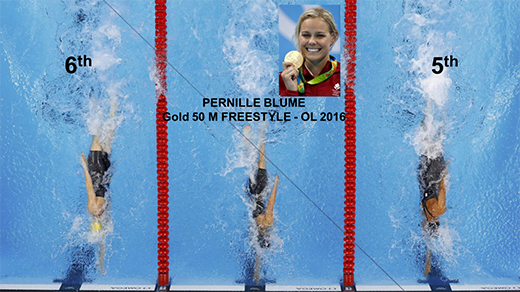 An example was given from when Pernille Blume won the Olympic gold medal in 50 m freestyle in Rio. The difference between the gold medal and 5th place was merely 0.08 s. At the same Olympic Games, the Danish men track cycling team lost the semifinal in 4 km pursuit race to Australia, due to a difference in average speed of 0.029 km/hour. For these reasons, use of technology is paramount in the constant pursuit of gaining the small margins that makes the difference between success or failure during the short culmination of a lifetime of training. In the pursuit to become better, sport physiologists study every aspect and detail in the performance and training, and are constantly looking for new technologies and tools to do this. Associate professor Nikolai Nordsborg and his colleagues from the department of nutrition, exercise and sport at Copenhagen University have been a close partner and supporters for Danish athletes during many years, and we don’t think that we offend anyone by stating that this research group has a share in numerous Olympic, world, European and Danish championship medals for the Danish athletes. Nikolai Nordsborg gave the first technical presentation with the title: “Optimized training with devices”. Examples where given on how data from sensors and devices provide a vast amount of data, but also that the applicability of such data, in order to improve performance is often very small. As an example, monitoring of heart rate data alone, provide absolutely no information on whether the training is effective or not. The take home message was that we are really good at collecting data, and that individual personal profiling can be made very precise. But our ability to give detailed training advice, based on these data is limited, and that data is useless without the proper processing and interpretation. The second technical presentation was an example of an enabling technology, as opposed to the “inside out” perspective of Nikolai Norsborg. Graphene is often termed the wonder material that will revolutionize technology as we know it, having a very large array of use perspectives. Professor Peter Bøgild from DTU Nanotech is an inspiring and visionary technology enthusiast, who leads a research group on carbon nanomaterials and other 2D materials. He gave us a tour of graphene and its potentials and pitfalls within sports technology. Among the intriguing findings in graphene research is the fact that spiders that eat graphene, will produces webs that are 3 times stronger than ordinary webs! The title of the presentation was: Graphene for applications in sport technologies: A perspective. The take home message was that graphene applications are rapidly emerging and show an immense potential for sports technology. However, the materials are still expensive and standards and test protocols are needed. Peter especially pointed out that research has found that many of the commercially available graphene products actually just consisted of graphite. Hence, companies who might have tried using graphene, but did not get the improvements or functionality that they expected, could be due to poor quality of the product used. The presentation encouraged closer collaboration between academics and industries in this field, which we will certainly support here at IPU. The third technical presentation, was an example of how the applicability of a technology as a solution to a certain problem, is not straight forward. Interpreting how light stimulations influence the physical performance in sports is probably not the first thing that comes into your mind, but it is exactly such details that determine the small marginal in elite sports. Jakob Hildebrandt Andersen from DTU Photonics, gave us a presentation about how light technology has been applied to increase performance of the Danish swimmers prior to the Olympic Games in Rio 2016. Blue light was used both as a tool for reduction of jet lag for the Athletes, and for improvement of their reaction rate. The title of the presentation was: Light technology for increased performance. After these talks on technology and sports, from user and technology perspectives, the time had come for some businesses talks, showing examples of how Danish companies use technology in their products in sport. Most people with an interest in data and connectivity, and especially those who have attended the High Tech Summit knows our ability to measure and generate data has exploded during the past years. In sports wearables and sensors are also being used to unprecedented extents. As an example, running with a GPS watch, will generate numerous data graphs, that you can study after the run, but after the first few runs, most runners will just look at the distance and laptimes, and vast amounts of data is generated in the cloud, that are of no use to the user. The first business talk was a fantastic example of a very different approach to how wearables can be used for training. The Danish Startup company SHFT, has made a careful evaluation of what data is desired, in order to measure if you run right. However, instead of just presenting these data to the user, SHFT processes the data in real time and transforms it to simple instructions on how to improve your running technique. Based on impressive studies of running techniques and coaching, SHFT transforms the product from being a wearable to a trainable: a virtual running coach. The presentation was given by Tony Motzfeldt, CEO at SHFT with the title: “SHFT, the virtual coach”. The technology is currently using AI in order to adapt the coaching to the individual user, and to actively use big data and software algorithms to predict injuries at an early stage, based on deviations from previous running patterns. At IPU we find the methodology and approach that SHFT have used truly inspirational, and applicable for the general use of data and tracking in general industries. The second business talk was focused on how exercise and training can be stimulated by outdoor facilities. It is estimated that about 4500 people in Denmark die every year due to lack of physical activity, which is about 7-8 % of all deaths in DK. Kompan is a company who develops solutions for making children and grownups exercise in playgrounds and outdoor fitness solutions. Since many of our habits for exercise are developed in childhood, innovative and motivating solutions are not only a business, but also hold a general benefit for the society, individuals and families involved. 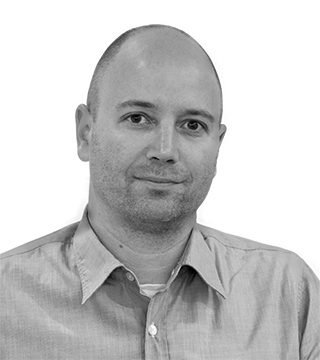 Apart from working with product development for the company Kompan, Morten Zacho works as an associate teacher at university of southern Denmark and has previously worked with the center for physical activity research at Rigshospitalet. In the context of the High tech summit, Mortens presentation was on the development of digital solutions to improve outdoor fitness. The presentation started by showing very poor examples of innovation for combining digital solutions and outdoor exercise, and introduced the term “fake-fitness”, for out door fitness installations that provide very poor physical training effect. The current focus is to make solutions that provide beneficial physical exercise, which can be accustomed to the individual user. The title of the presentation was: Digital solutions to improve outdoor fitness. The third business talk by Fredrik Tuxen, CTO at Trackman was, in our opinion, the perfect exemplification of how high tech industrial expertise and know-how can be used to enter and impact the sports market. Several Danish companies develop extremely advanced radar systems for applications such as defence and aerospace. Fredrik Tuxen has a MSc from DTU in radar and signal processing, and was previously worked as head of development at such companies. But Fredrik and some of his colleagues also happened to be passionate golfers, and regarding the trajectory of the golf ball, they spotted the potential to implement radar technology on a golf ball instead of a projectile. The company Trackman was formed in 2003 and today, Trackman has 250+ employees and is the dominating technology for tracking golf and baseball flight while the product line rapidly expanding into other sports. Being at the Technical University of Denmark, it was natural to end the session with a presentation and example of how technical education/ research and sport can benefit from each other. Presenting a physicist with the challenges faced in sports, is like letting a kid into a candy shop. Mirko Salewski from DTU physics has Msc in Aerospace Engineering and a PhD in fluid dynamics. Since 2015, he has teached the DTU course on sports physics, in close collaboration with the Danish National Elite sports team. The students are presented with some cases, provided by Team Denmark, related to the training and performance of the athletes. As a part of the course, the students then identify the relevant mechanical and physical parameters and perform calculations on how they relate. The outcome for Team Denmark has been better understanding on how to improve the performance, with benefits that are directly measurable.